In 2038, a gang of scavengers infiltrate an industrial complex on a island within a prohibited zone. They are looking for the element Texmexium, which is rare and very valuable. The scavengers are killed off by the automated defenses, until only Brooklyn, the group's mechanic, is left. He discovers a stranded Texas Air Ranger and two children living among the complex's rubble. Together, they must destroy the Kyron-5 computer in order to escape and warn humanity. Brooklyn discovers a GUNHED (from "Gun UNit Heavy Elimination Device") combat robot left over from when a battalion of Gunheds were sent to destroy Kyron-5. Brooklyn works to restore it to operation. Meanwhile, Babe, one of the scavengers killed earlier, has been transformed into a bio-droid and is seeking out Sergeant Nim and the Texmexium she stole. In order to save her and destroy Kyron-5, Brooklyn must overcome his fear of flying and pilot the GUNHED to the top of the complex's tower. The computers single large defence is the robotic Aerobot. 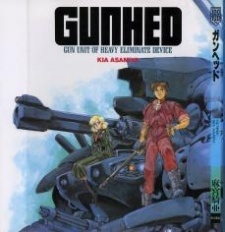 Gunhed isn't one-shot material and it isn't material for three chapters. The overall plot was quite interesting, but the execution ended up being pulled back from what it could have been because of the fact it could have easily have been six chapters at least. The art was also highly detailed, particularly for a something from the late 1980's. Characterization was also weak because of how much was crammed in at once and it felt like the reader only got a glimpse of the world. It left me wanting more as well as feeling disappointed because I liked what I did see.